A nursing student talks to her patient. The patient coughs and says he is having chest pains. Soon, he’ll stop breathing and the student will start CPR. Pharmacy students are providing a patient with his medications at the pharmacy when he suddenly becomes agitated. After discovering he is experiencing low blood sugar levels, the students give him something to help. A Spokane police officer lays his hand on the gun in his holster. He’s commanding an individual to show his hands and to settle down. The individual then pulls out a gun of his own. A truck driver is driving on just four hours of sleep. He’s driving in a forested area at high speeds. His truck is deviating from its lane, creating a dangerous situation for him and others on the road. These scenes are from various simulation programs on campus and are used for clinical instruction, research or both. 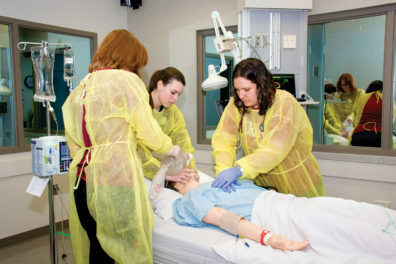 In the College of Nursing, students treat Sim Man, the high fidelity mannequin in the hospital bed in the simulation lab. It’s there where students get their first chance to experience a simulated hospital setting. Sitting behind a tinted window is an instructor who can control what Sim Man says and does. The instructor can make Sim Man cough, stop breathing and much more. They can also talk on behalf of Sim Man. Nursing students are introduced to Sim Man during their first semester on the Spokane campus. “We run 33 groups through and I want all of them to have the same exact experience,” said Nursing’s Kevin Stevens, B.S.N., M.S., the director of the Program of Excellence in Clinical Performance and Simulation. Nursing instructors can simulate a number of situations. Sometimes, Sim Man slowly builds toward a health crisis and the students are tasked with realizing it on their own. Stevens says she often hears from former students who share how valuable their experience with Sim Man was for their current job. In the College of Pharmacy, similar scenes take place. Pharmacy students begin using simulation during the spring semester of their first year. Students are trained with both mannequins and Standardized Patient Simulations, where paid actors play the role of the patient. “It allows students to practice in a safe environment before they go out into patient care settings,” said Brenda Bray, M.P.H., the assistant dean for assessment and accreditation in the College of Pharmacy. Bray says the simulation prepares pharmacy students prior to their clinical rotations – especially acute care experiences like the emergency room or intensive care unit. Like the College of Nursing, pharmacy students conduct a debriefing session after each simulation experience. Bray says those sessions allow the students to do the true learning that the simulation process is designed for. “During the debriefing, it is common for students to reflect on the scenario and self-identify areas for improvement of clinical decision making or team behaviors,” she said. The simulation exercises show students the depth of what a pharmacist can do. Lois James, Ph.D., and her team use video scenarios projected onto a big screen in their research into decision making by police. Officers are hooked up to monitors to measure the physiology of their brain and they have a modified pistol at their waist that shoots a laser. The pistol is also hooked up to monitors. Studying how and when police officers decide to use deadly force is complex. In recent years, this research has been under the microscope given current events. Some research studies on police and deadly force have involved a scenario on a screen and a police officer simply pushing a “shoot” or “don’t shoot” button. In James’ research, the video scenarios are much more realistic. They feature custom made, evidence-based scenarios where a suspect is present on video. Police officers using the simulation literally shout commands at the suspect on the screen and must decide whether to fire or not, given the suspect’s actions. The police officers in James’ research exhibited strong physiological responses. “Using this method, we have advanced the field of research on how officer fatigue and bias influence decisions to shoot,” she said. Not far from where police officers participate in James’ research sit driving simulators. The simulators have been used in various research studies. 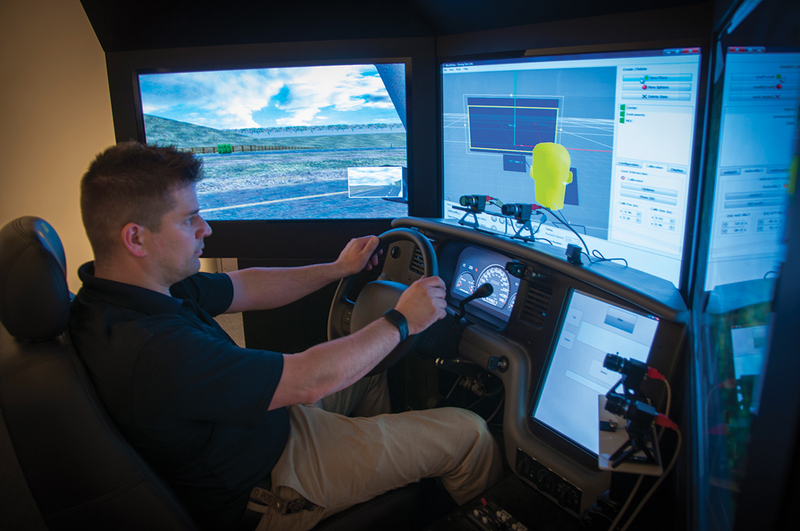 The driving simulators are used to study police fatigue, distracted driving, truck driver sleep schedules and their impact, and more. Hans Van Dongen, Ph.D., a sleep scientist and director of the Sleep and Performance Research Center, has used the driving simulators for his research and has secured a patent for drowsy driver detection technology. It’s clear that simulation aids both students and researchers. Using the technology in place at WSU Spokane, health sciences students are better prepared for treating patients as they enter the workforce, and researchers can gather more precise data from real situations to help solve problems.